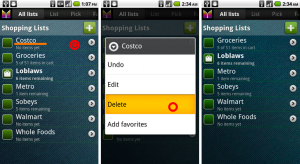 All lists tab allows creating any number of shopping lists, change list names, select current list, open a list for shopping. You may want to name a list after a store like “Whole Foods” or “Costco” to track products you want to buy within a specific store. You can re-order records manually if you switch to Edit mode (lightning button), then touch dragging icon and move record to the place you want. Tap on the right side of a row which you would like to modify. Make changes in Edit list screen. Tap Done to close Edit list screen. Navigate to All lists tab. Long click the list you want to delete. Select Delete from the list of options. The shopping list and all its items will be deleted. Note: if you need to rollback changes, click Menu –> Undo. Click (>) next to the list you want to configure specific favorites for. Click on List-specific Favorites to make sure it is checked. Go to Favorites tab by clicking Favorites. Populate favorites list with specific items for this list. From now on, the Favorites tab for this shopping list will contain only items you have chosen. 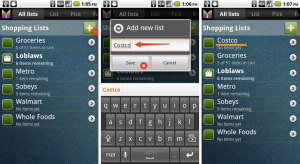 Super-lists allow grouping several shopping lists into a single listing. 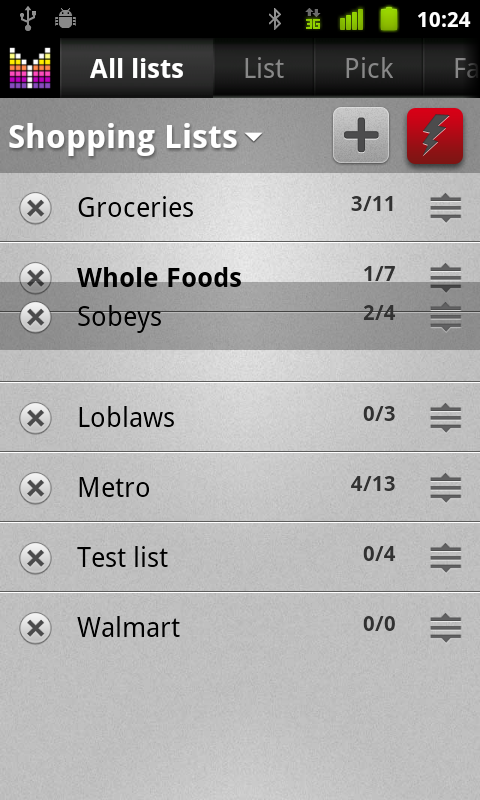 The most common use is to have a shopping list, say “Groceries”, to aggregate items from shopping lists associated with stores like “Loblaws” or “Whole Foods”. Click (>) next to the list you want to configure as Super-list. Click Super-list to make sure it is checked. Click on Sublists and check sublists you would like to include into this super-list. 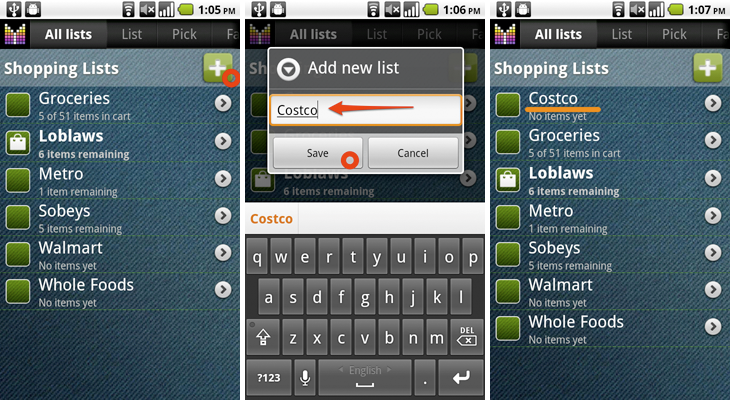 From now on, List tab for Groceries will display items from enclosed lists grouped by list names. If item is assigned to a Super list, it will be displayed in every sublist. Items in master list are grouped by sublists. Aisle grouping won’t take affect. A shopping list may be enclosed in several Super-lists. Super-list cannot be sublist of another Super-list. Dan, unfortunately there is no certain release date for the multi-store support feature. It is planned for one of the future updates. Hi! I downloaded the app and I have paid for the upgrade. So I’m just about to add my List (stores). When I’m at the home screen, I click on “All List” and it takes me to the All List screen. 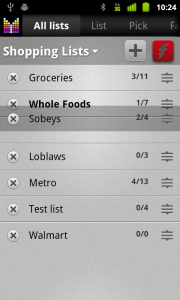 Under this screen it already shows some list; “Groceries, Favorites, Pantry, Todo.” Can I delete these list? or Hide them? I just want my Stores Listed here. Elena, unfortunately there is no way to delete Favorites, Pantry and Todo. But if you select “Shopping lists” in the selector at the top of “All lists” tab, those lists will not be listed. Then rename “Groceries” and add any other stores you like. Hopefully this helps. I use my Superlist “Groceries” to compile shopping lists that appear in two Sublists “Coles” and “Woolworths”. So far so good. But each Aisle in a Sublist can only have one Parent Aisle. In many cases that works OK but often it doesn’t work the way I need it to. For example, Aisle 2 in the Coles list and Aisle 5 in the Woolworths list both have Parent Aisle C in the Groceries Superlist. But how do I deal with a situation like this? Cereals and Health Bars are both in Aisle 2 at Woolworths but at Coles Cereals are in Aisle 5 and Health Bars are in Aisle 3. If I compile a shopping list that includes Corn Flakes and Muesli Bars in the Groceries Superlist, they both turn up in Aisle 2 in both Sublists. Is there any way to make the Muesli Bars turn up in Aisle 2 in the Woolworths list and in Aisle 3 in the Coles list? Peter, thanks for your feedback. Unfortunately, there is no straightforward solution for your situation. We have plans to improve multi-store support going forward. Make it possible to assign the same Parent Aisle to multiple Aisles in a Sublist. 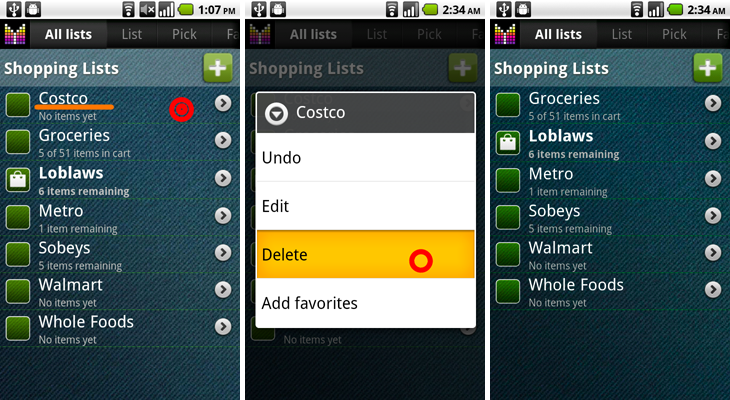 Then I can let all the items in my “Grocery” Superlist remain in the system default “Other” Aisle. I can assign “Other” as the Parent Aisle to every item in both Sublists. Would that cause Muesli Bars to be grouped under Aisle 2 in my Woolworths list and under Aisle 3 in my Cole’s list? Peter, unfortunately, no. In this case items will be grouped by “Other” aisle. 1. Enter in GROCERIES superlist and see the items in both sublists. 2. Only one instance of each item in each list. 3. Woolworths aisles and prices in the Woolworths sublist, Cole’s aisles and prices in the Coles sublist. 1. In the Superlist, tap the Add button and enter text into the Add Item search field. 2. The Search function searches the Superlist picklist and the picklists of all its Sublists. 3. The Autocomplete function adds to the Search dropdown any item in any of the picklists that matches the growing search string. Only one instance of each item is displayed in the dropdown. – if the selected item is found in its picklist then it is added to that store’s shopping list with values list = [Sublist name], aisle = [Aisle for item in that sublist], price = [Price for item in that sublist], etc. – if the selected it item is not found in its picklist then a new instance of it is added to that store’s shopping list with values list = [Sublist name], aisle = [null], price = [null]. [Sublist name] and any new values such as aisle and price. Peter, thanks for your thoughtful feedback. I am adding this for consideration as part of improvements of Mighty Grocery multi-store support in the future. Thanks for your cooperation. I have been a loyal user of Mighty Grocery for about 4 years and I still love it. My wife and I both have it on our phones and she also uses the web UI. However, the one feature we *really really want* is the multi-store support. Honey in ShopA is in a different aisle from honey in ShopB. Multi-store support would make it possible for us to make full use of the price compare feature. 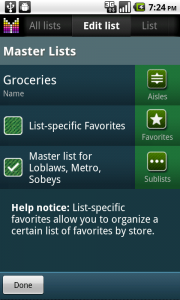 Do you still have plans to release multi-store support, or at least to add separate Aisle handling for sub-lists? YAY!!! Thanks so much Alex for the beautiful multi-store support. I don’t know how long it has been in Mighty Grocery but I have just discovered it! I used it last week while shopping for groceries in 2 different supermarkets. I am sitting down now to read the online documentation about it. Thank you my good friend – it makes Mighty Grocery the undisputed king of shopping list apps! Now, I installed Mighty Grocery at least 4 years ago and I don’t remember paying anything. Just so you know, I would be happy to pay an annual subscription and I am sure others would too. I have the same problem as before. If I use a Superlist with two Sublists, the Sublists have their prices and aisles locked together. If you change the aisle or price for an item in one list, it also changes in the other. Also, i deleted old lists in mobile version but still see them in web-version. How can I dispose of them? Anzhelika, you can delete shopping lists from cloud under Menu > Settings > Accounts > (your account) > Cloud actions > Delete lists. I would like to create menu and add products and reciepts on a web-site, not in a mobile phone. It will be more comfortable for me. Will it possible? Anzhelika, unfortunately editing recipes is not available on Mighty Grocery website yet. We plan to add this feature going forward. Please help! I just need one list of EVERYTHING I buy that stays the same no matter what. Every time I remove an item from any list, it gets deleted from my “master list”. I have tried every list in every way I can understand from the directions and I’m ready to give up. Susan, kindly note that you need to add your items to Favorites so they would stay longer and could be reused on your shopping trips. Please see Favorites User’s Guide for more details. Susan, what do you expect to see when you go to sublist? I think I accidentally deleted the shopping list and that is why I am not getting master and sublist. Is there a fix fix for this. Susan, you could try restoring backup from cloud or from your SD card. The app creates backups on SD card once every 3-4 days. In case of an accident, you can undo any action in Mighty Grocery under Menu > Undo. Susan, thanks for your suggestion. We have plans to import recipes going forward. I am new to this app and would like to know how to compare prices at different retailers for a specific item or items on my list. This feature ,if available, would make this beautiful app THE MUST HAVE APP for me and my family. Thanks for your comment. Unfortunately, Mighty Grocery requires manual data entry for price compare. We have plans to use retailers’ data in the future.